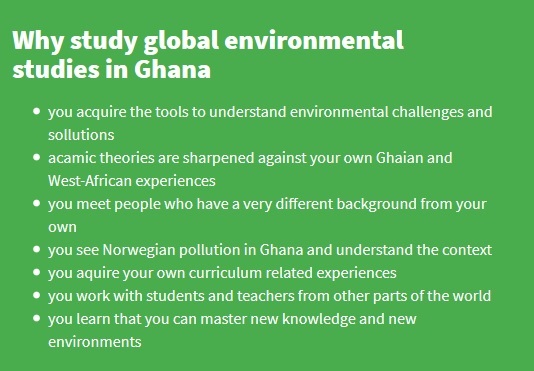 This course gives a social science introduction to the most important fields within global environmental studies in general and West Africa in particular. It digs into the causes and dynamics of environmental challenges and dynamics, and different perspectives on management of natural resources. It is a full semester course, 30 ECTS, and is offered in cooperation with Oslo and Akershus University College. The course presents various ways that major environmental issues are seen as global challenges and are discussed in global fora. Furthermore, the students learn about specific cases of such issues in Ghana and other West-African countries. In these cases, the course provides insights to concerns by various actors at local and national levels. The students gain a basis for critical analysis and reflection upon the causes, dynamics and proposed solutions to environmental conflicts. The course places a significant focus on field experience, including three field trips during which the students will be able to engage directly with some of the major environmental concerns facing Ghana. The contingent nature of truth. Writing skills and argument formulation. Understand better the complexities involved in resolving some of the major global environmental challenges. The majority of the students are from Skandinavia, with an increasing number of participants from other European countries. Kulturstudier offers scholarships to students from Ghana. This is to make our program accessible to local students, that might not otherwise have the financial means to participate.The scholarship students helps the visting students connect with, and understand their environments. The differences in the students' social, academic and professional backgrounds also make for interesting debates and seminar groups. Approximately one third of the students come directly from college, one third has started their bachelor programs and the last third is made up of experienced students. The main objective of the program is to bring to life the academic theory, and enable the students to make real life comparisons. While it is up to the students to make the most out of the experience, we organize field studies where the students will encounter relevant real life examples that challenge the more abstract concepts of the curriculum. The self-study period: before you travel to Ghana you are expected to get acquinted with the curriculum and write an introductory assignment. The main periode: consists of ten weeks in Cape Coast with lectures, seminars, field trips and group assignments. The self study assignment and the home exam can be done anywhere in the world, why not in Ghana? The course is worth 30 ECTS and can be included as part of a bachelor degree. You can also combine the course with any of our other programs in India, Vietnam or Argentina. Environmental degradation is one of the major challenges of our time. Still, expertise in environmental policies and global context remains in short supply, and we see large institutions forming as an answer to the hunt for sollutions.